Sloughs that crisscross Potter Marsh provide habitat for waterfowl. Potter Marsh, at the southern end of the Anchorage Coastal Wildlife Refuge, is an ideal break from Anchorage for birders and other wildlife viewers. From the Seward Highway just before the left turn into the Potter Marsh parking lot, you are treated to a stunning view of Turnagain Arm. A wooden boardwalk winds 1,550 feet from the parking area through the marsh and across watery openings and sedges, perfect habitat for a rich variety of birds. From late April through September, Canada geese, northern pintails, canvasback ducks, red-necked phalaropes, horned and red-necked grebes, and northern harriers use this wetland. Look for eagle nests in the cottonwoods near the base of the bluff using binoculars or a spotting scope. Eagles have a sharp sense of sight and can see at least four times better than people, enabling them to detect movements of small animals like hares from a mile away. When eagles soar overhead, they are scanning open areas for prey. 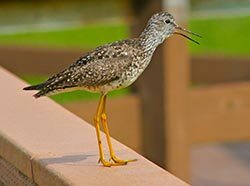 From May to August, gulls, Arctic terns, shorebirds such as yellowlegs, and occasionally trumpeter swans are present during spring and fall migration. In addition to birds, look for slow movement and a v-shaped wake in the waters of the marsh, signs of muskrats swimming past. Their small brownish heads peek just above the water as they meander in and out of the wetland's open areas. Moose also frequent the marsh year round. May and June are good times to see these large ungulates standing in the marsh foraging for new growth. About halfway along the boardwalk, Rabbit Creek flows underneath and provides a good spot to see spawning chinook, coho, or humpback salmon from May to August, depending on the species. Spot their bright red bodies swimming in the creek. 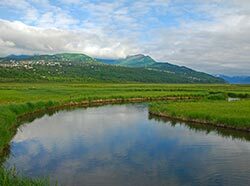 With its nearly panoramic view of Turnagain arm, Potter Marsh, buffered by spruce, cottonwoods and alders, is one of the most accessible and scenic wildlife viewing areas in Anchorage. Do not disturb nesting waterfowl or migrating salmon. Fishing is prohibited in Potter Marsh and in the creek west of the highway. Visitors should prepare for cool and windy weather even on sunny days. Occasionally, vehicles in the parking lot are broken into - leave valuables at home, lock them out of sight in the trunk, or carry them with you. If you are planning to stop at the south end vehicle pullout, please signal to other highway travelers well ahead of the turn. Potter Marsh has 0.5 miles boardwalk, accessible bathrooms and designated parking at the main entrance. Roughly fifteen minutes south of downtown Anchorage, Potter Marsh is accessible from the New Seward Highway. The entrance is located just past the Rabbit Creek exit and across from the Rabbit Creek Rifle Range entrance. A small highway pullout at the southern end of the marsh also allows for viewing and photography.